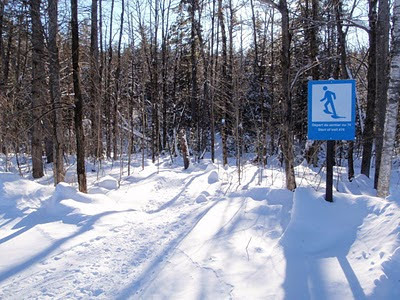 As mentioned in an earlier post, the NCC has opened up some new snowshoeing trails in the Gatineau Park this year. 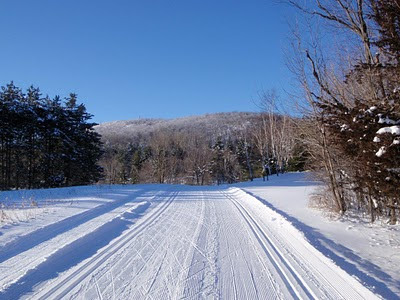 Today was our first opportunity to try Trail #74 in the Lac Philippe area, near Sainte-Cécile de Masham, just west of Wakefield. 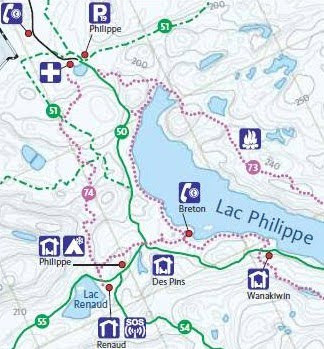 Looking at the map of the Gatineau Park, it's not obvious where the trail starts, but you can tell that it's not quite connected to the main parking lot (P19). If you keep your eyes open (we didn't) when you get to P19, you'll see a blue and white sign indicating that Trail #74 is to the right. If you follow the road leading up to the first-aid center, you'll find a rather large parking lot at the trail-head. 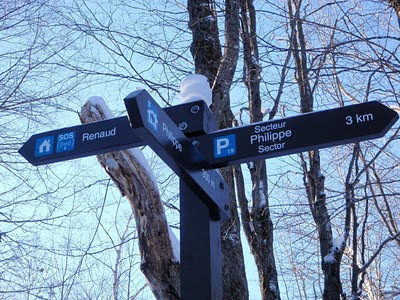 There you will see another blue and white sign (we saw this one) showing you the way. It felt really good to be on this trail. Let me say that again in case you missed it: it felt really good to be on this trail. 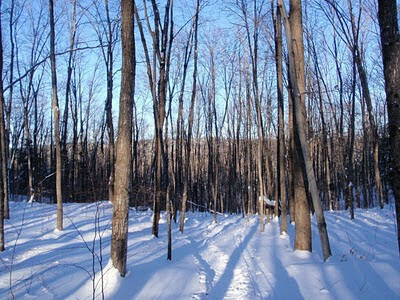 In the wilderness, among the trees, through the valleys and over the hilltops, under a crisp blue sky with barely any wind. The NCC has really given us a gem with this new trail. The scenery was very nice along the entire trail. The distance from P19 to the Renaud shelter is about 3-1/2 km (2 miles). 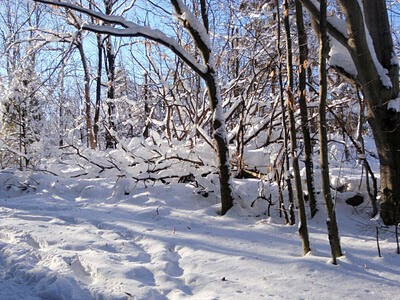 About 200 meters (200 yards) before you reach the shelter, you come to a trail intersection. 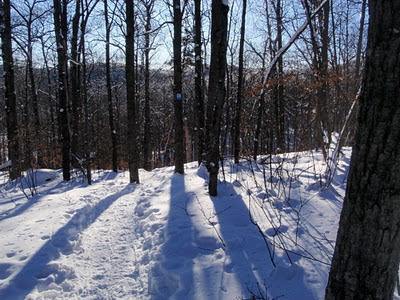 From there, the Philippe cabin is 300 meters away (300 yards) along an unnumbered trail that leads to Trail #73. As you (carefully) cross over cross-country trail #55, your met with a great view to your right. 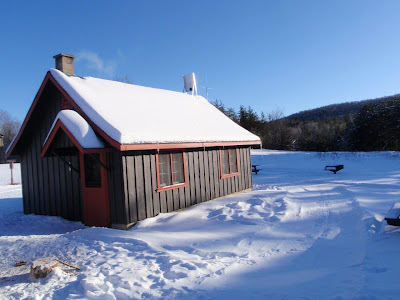 Within a minute or so, you reach the Renaud shelter equipped with a half-dozen large pine tables and benches, a counter top for food preparation and a wood stove to dry your clothing and to warm up your food. The shelter is also equipped with an emergency radio. It took us about 2-1/2 hours to get to the shelter and to return to P19. 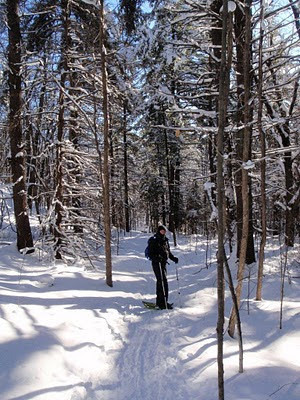 Snow conditions were semi-packed, with plenty of powder for anyone venturing off the trail. Signage was exceptionally good from start to finish. 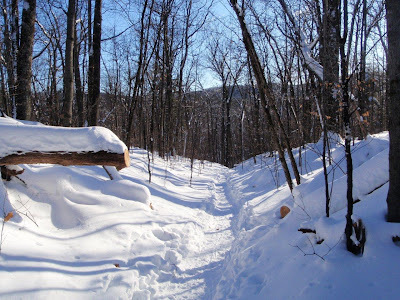 I won't hesitate to come back to this trail again this winter and I highly recommend it to others. Did it take you 2-1/2 hours each way? I'm a Scout leader and am thinking about a trip into there. I believe it was 2-1/2 hours for the round trip. If I had to guess, probably 1:20 on the way up and 1:10 on the way down. We are going to take our troop in for an overnight stay. Your blog really helped us out - great blog! Glad you found the blog useful. I just got back from Trail #74. Hope to publish update later today. Yes, excellent blog. I have out of town guests coming and this really helped me plan a trail.